Wondering if you could do a blog sometime on how to layer a home so it doesn’t look like you bought everything from a furniture showroom? I mean, I wanted charming home decor but ended up with a sterile furniture showroom! How does one wade through the clutter, knickknacks and artwork and edit what to display so a house feels warm and cozy? It’s incredibly challenging! My goal is an uncluttered, yet finished look. When we bought this house I envisioned a rustic, elegant lake house style with a calm, airy and neutral palette and somehow it morphed into busy and cluttered with no real style direction. I know it’s not right but can’t quite put my finger on why it’s not. Even the kitchen! I regret the painted tile backsplash, which ended up dictating the entire color scheme. What I really wanted was a house with lots of green and ended up with a grey and blue palette. I’m struggling with what to do to finish off the family room space. We never spend any time in here because it’s not an inviting place. I know that the brown chairs are too big. I hate them. I’m 5′-7″ and my feet don’t even touch the floor when sitting in one of them.We hired this decorator who talked me into a lot of things I didn’t think were quite right. But she assured me that it would all be fine. It’s not fine and now I’m kicking myself that I didn’t put my foot down. Although, I do have to say, that she did a fabulous job of the renovation and breathing new light into this dark, dreary and bizarre home. This is the room that feels sterile to me. The ottoman is going away and I think adding tables and lamps will help to give it personality. Do you always like to see window treatments on windows? I hesitate to cover these because the view is beautiful. PS: I am not expecting free advice and if you don’t have time or this topic doesn’t suit you, no problem at all! I was curious about this one, so I asked Kathy if she could send me a couple of photos. A few hours later, she did. Well, more than a couple, but all in one email which is fine. This is a seriously gorgeous home! However, I can see exactly what Kathy is talking about; it’s not a charming home, just yet. It has the potential, but it’s not quite there. There’s a compelling reason why nobody goes into the family room. This is an issue that’s as common as cornflakes. The room is a little sad. In the key of B-flat. This room does have light, medium and dark, but too much medium and the light is only on the walls which is creating an imbalance. There’s just too much gray. And even a neutral room needs some color. Let’s talk about what is right with the room. I think that there is plenty that IS right and that’s the good news. The room (and entire home) is intrinsically pretty. There are big, bright windows, A handsome and in-scale fireplace wall. Hardwood floors in a deep rich color. The sectional is lovely too! In fact, I rather love it! And that one is a big deal, because it’s more common that the sectional gets mucked up. The rug is okay but a part of the one-note issue. 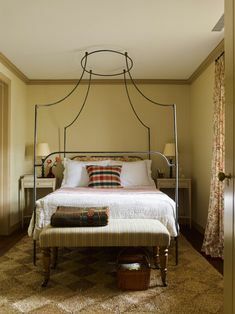 The chandeliers are a good size and the iron is appropriate for the rustic, casual style that Kathy wanted. The basic layout is almost okay. I say almost because of the aforementioned BIG GRAY-BROWN CHAIRS. Now, let’s look at Kathy’s wish-list. I’m not really seeing much in the way of blue. I am seeing beige and gray. But there’s no reason that we can’t add in the green. We’ll get to that in a minute. What is a beautifully layered home? I think it’s easier to show than try to explain. And the first designer who comes to mind who has style to burn is William McClure. Not only is he proficient and interior design, he’s a superb stylist AND an artist! A real interior design triple threat which is exceedingly rare. I am completely besotted with his rooms! A throw on a chair and a pillow. Artfully arranged console. White painted floor with dark blue ribbon banding. Sublime! A largely white, neutral room but not completely devoid of color. I think I just have to have a home with white-painted floors! Books. Lots of big beautiful books. Multiple shades of one color. In this case, blue. And Chinoiserie accents! If you look at William’s portfolio, you’ll see this room in red and I think I found another iteration in navy. It seems he uses his home as a lab of sorts. Or else, he just likes to change things around a lot. Is that a tortoise under the table? haha. Whatever. See how beautiful it is to style the coffee table with big books and one elegant vase with fresh flowers. Of course, the best accessory of all, is his gorgeous Weimaraner. Lucky dawg! Black walls in the bedroom. But it doesn’t look dark to me. Beautifully styled chest. William is a master at stylish layering. And it’s one of those things that is difficult to explain how to do it. But, we can see when it’s not quite coming together. I think it would look great to create a collection of something, or use one of William’s vignette’s as a template of sorts. So, the first thing is we need to find a new home for the family photos. I see this a lot. A lot of family photos scattered around the house which are used to decorate. It tends to look a little common. But, of course, we must display the photos, just not in the entry. I would create a beautiful gallery wall in the hall of family photos. Now for the great room and the need to create some charming home decor. Kathy wrote me later and said that she thought that maybe the chairs would grow on her. No, it’s the other way around. She is going to begin to grow on the chairs. They are the number one issue. I think that she should not continue to put good money after bad, as they say. Perhaps sell them on Craig’s List or give them to charity and take a nice tax deduction. Or maybe they could go in the basement if there’s a finished basement and they’ll fit down the stairs. I think the chairs should be far smaller. This room needs some color and I found the perfect shade of green in one of my favorite occasional chairs from Jonathan Adler. It’s available in numerous fabrics. I love this rich, deep green! Here’s a mood board I made. It’s not 100% complete. This is a family home and probably there wouldn’t be as much stuff as in William McClure’s rooms, but I put in a Brown and white Chinoiserie vase and a little bowl for starters. The brown and white temple jar would also look great on the fireplace hearth as long as she doesn’t have kids as wild as mine. I brought in more green to balance out the chairs and to bring a little life into the room. The opium coffee table is a one-of-a-kind vintage piece. Sometimes you can find pieces like that on One King’s Lane. First Dibs has them but are usually pretty expensive. Then, there’s Circa Who. And having a few pieces like that is one way to get rid of the sterile furniture store look. The side tables are from Noir Furniture which is one of my fave sources in Laurel’s Rolodex. I think bringing in a bit of black (and white) is important to balance out the room better. If I had been starting from scratch, I would’ve chosen a different rug. I think the rug needs to have some white or cream in it. It could be a simple geometric like this also from Jonathan Adler. This would help balance out the white walls. And the geometry would add a fresh, classical element, I think. Jonathan Adler has lots of fresh, geometric rugs in his collection. The green lamps are from Currey and Company. The chairs in the back, I would love to see with another pretty pillow. It could be this one. Or another pillow with green in it. And here are some other pillows and a cool but expensive stool. Please notice that they are coordinated but not perfectly matched. We want to add some color to the sectional, but not toooooo much color! Below are the links to the rest after the Hothouse Flowers pillow. I can’t quite make out the entire back wall, but I would create a wonderful gallery art wall. For Kathy’s gallery wall if she chooses to do that, I would have lots of neutral tones but also bring in some greens, blues and maybe a few other colors. This was a challenging exercise. Of course, it is far easier to start from scratch when designing a home. Kathy shouldn’t blame herself. It’s exhausting to renovate a home and it’s easy to run out of steam and let someone else take over. No matter what she does, I don’t think it would take much to add the touches that will make this gorgeous home into the cozy, charming home of her dreams. Thanks so much Carol. That was my goal from day one. To share everything I’ve learned (and am still learning!) and rock it with beautiful visuals. Praying that Matthew won’t be too bad. I love that you have a cherished piece of furniture that won’t be parted with! But, actually, most upholstered furniture IS still made in this country. No, not the super-cheap crapola stuff, but custom upholstered furniture– definitely. Even good ol’ Pottery Barn is manufacturing their upholstery in North Carolina. They even have a video on their website. This renovation has a lot going for it. I love the paneling. The man sitting at the piano is a nice touch. The one thing I realized reading your blog is I need to see everything that goes into a room as a single idea that works together. For example, I don’t think I would like that coffee table if I saw it alone. But when you put it all together, it really works. Great job! How do you work in the family pictures? My wife and I disagree about this. I say gallery in the hallway like you did or only a few here and there. Most of the time I think they look tacky. We compromised by allowing me to add filters to either make them black and white or distressed so they fit in better as art. It’s true that context is incredibly helpful. Even for us designers. I can’t tell you the number of times, I’ve walked into a fabric showroom and seen a chair or sofa upholstered in a fabric. It looked amazing but if I had seen the fabric in isolation, might’ve skipped over it. Another grand post. I learn so very much from your postings. First, I have to say that I just found your blog & I’m so glad I did. Not only are you entertaining but also very educational. I love the advice you give. Now onto my opinion…I’m kind of surprised that Kathy’s designer didn’t finish the job with accessories. That’s the most important part! I also think some house plants go a long way in adding life to a space. And I think Kathy desperately needs drapery treatments. 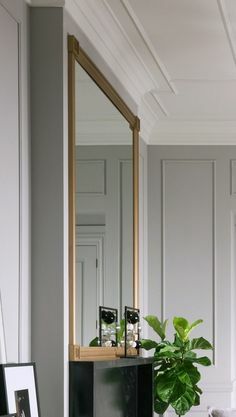 They add so much to a room to give it a finished look. She shouldn’t be concerned with them concealing her view. Stationary panels shouldn’t cover the glass anyways. They’re stacked back on the wall. Welcome to the blog and thank you for your kind words. I agree that the windows would look lovely with drapes, but here’s the problem. Maybe you didn’t notice but surrounding all the windows is beautiful panel moulding. In fact, it looks like it was done that way intentionally with the idea that there would be no window treatments. Otherwise, what would the point be if it was all covered up? I have seen the BORING phenomenon many times and you are so right, explaining to people how to animate their space when they have done so many things right can be hard (and little risky!). Thanks for addressing the ” issue, it is a big one and as usual you nailed it with great ideas and good humor. Sounds like there may have been some offense taken from my comment. Laughing that I’m another southerner with swivel rockers in my home. Why my Lee chairs do both, I don’t know. No offense taken at all! I’m sorry you thought that. Great suggestions! I went a little further and looked at your gallery wall post. As part of a house warming gift for my new neighbors I am going to “hang” their art this afternoon. Haven’t seen any of it yet…but my signature is “gallery” style. I am making a file of walls that I will send you when I finish! I agree with what you said. But here’s the problem. There are many givens that can’t be changed, so while wanting to infuse some color, felt that it would also be a mistake to get too carried away with it. The kitchen and dining room which I did not show are also gray and white. Oh gosh Ann. Good question; who knows? But actually, there IS a current trend for a dark green. I really don’t pay much attention to the latest trends— unless I feel they have legs. I’ve written about that. Yes, it’s true, you don’t have to get too “themey” with gallery walls. But that too is an art and one that is not that easy to get right. That is a superb point and something when designing for a client that I take into strong consideration. Of course, I’ve spent my entire career working in Westchester County. So, green is immensely popular. But actually, mostly it’s quite conservative. In fact, to be honest, much of what I convey is not what I have done because of that. Once, I had a client and I did most of her lovely home in Bedford but built in the 60’s. She did a small reno. We moved a doorway which made a huge difference. Botoxed the kitchen. lol (paint, new backsplash and counters). the living room had beautiful but a beige tone on tone sofa. Gorgeous jacquard fabric and two linen velvet but beige chairs. We did a gorgeous new fireplace mantel, pretty pillows, a seagrass rug, black side tables, lamps, white line drapes with Greek Key trim and pillows. Accent color was red. And then I had these gorgeous glass front fretwork bookcases made. Unfortunately, that company went to pot. But they did a nice job in those days. Gosh, I am taking a long time to get to my point. I wanted her to paint the walls red. There were also two large doorways and two large windows on either end. Very little wall. She was nervous about it and despite my assurance that it would be gorgeous, she just couldn’t get there. So, fine. We chose a lovely cream. I went back after everything was installed. She was very happy and it looked terrific. I’m wondering if I could add a suggestion, the foyer ceiling with its very white paint ( tongue and grove?) needs to be painted several shades darker, this might make the wallpaper feel less glam and blend the wallpaper background color up the ceiling and create a less abrupt line. Id also suggest that she replace the dressy chest and get a beautifully shaped walnut live edge console with or tall standing mirror with a long bench covered in a hearty green so the connection with the new lamps, pillows will make the large pattern although muted it’s distracting without something colorful to balance it- it’s all too busy and my eye kept drifting over to that area and not in a good way. That paper should feel more like an accessory rather than a over powering pattern. Id also change the lightbulbs – clear round bulbs or Edison might look less formal. Getting the entry area in sinc with the family room will transform the entry from confusion to intentional. I realllly disagree with the Johnathan Adler velvet occasional chairs for this room, sorrrryyyyy, don’t hate me! Ha! I love the chairs, I think they are lovely and would be great in a chic New York apartment with herringbone patterned oak floors.. they just don’t look like they would ever land in this family room even by accident. Art Deco meets Pottery Barn? The room is sooo casual, that earthy fireplace and casual skirted sectional.. I think a beautiful leather small scale chair nothing skirted. I do love those beautiful throw pillows- and lamps-.. but honestly as beautiful as her windows are, they look unfinished with a sectional backed up to them.. she should do simple bamboo roman shades- they won’t obstruct the view but visually at night they’ll look wonderful rather than a wall of black. Plus the added color during daylight will look beautiful with the green landscape and pull your attention to the view – the natural golden colors in the bamboo will reinforce the golden strong color of those fab. tiger print lumbar pillows! I love your suggestions for everything! I myself, was on the fence about the JA chairs, stylistically, you are right. But then I thought, oh why not? Why not mix it up a little? But it’s certainly not the only chair. I just love the color so much and the point is that the chairs need to be a lot smaller. I especially love your suggestions for the entry. Yes, a darker ceiling color is in order. It’s a little like a slip showing under a dark velvet dress. Definitely a larger more impressive mirror. Hard to see what that piece of furniture is, but definitely something a little lighter would be better. And yes, definitely bring some of the green into the entry. A bench is a great idea. Thanks for sharing all of that! It makes it like how I would work with a client. Sometimes I’ll throw out an idea and I’ll get “the look.” And then, I’ll rethink it. Sometimes… and this happens a lot too. I’ll give MYSELF the look! I usually sit on the idea for a few days and come back to it. And then if something is out of place, it will speak to me. I don’t know if other designers do that too, but I treat every job as if I were doing it for myself. Wonderful post,as usual Laurel! So, speaking of coffee tables, we have a huge square one, so no matter where one would sit in our 19×19 foot family , you have a piece of coffee table for your coffee! I have 2 gray sofa’s and 2 neutral color English Roll Arm chairs . Using Absenth color pillows and a watery looking flower print for the sofas, on the chairs , I used 2 pretty pear green throws and geometric print lumbar pillows. I did divide the areas on the coffee table for displaying my Art book coasters, large primitive wooden bowl in the center filled with lemons and artichokes, and Georgian candlesticks! I think the room you show does need GREEN, how about some real palms, or ferns, real or artificial. I would need some lamps for reading….floor lamps, or what about a sofa table behind the sofa with nice tablescape ? Or, include a pair of lamps with black shades! I used a pear green as accents in my kitchen and family room that are open! Very fresh, with the grey sofas…..also am thinking, the rug could be larger for my taste. I would like to see the rug to go under the sofa’s back legs. Your room sounds fabulous! I love big square coffee tables! Also thanks for sharing the great ideas. I looked at some of those options and thought about a sofa table as well, but needed to draw the line somewhere as this post took me much longer than I had planned. In real life, this phase can take me 15-20 h0urs or more! And I love the input I get from clients as well. I would put the sectional in opposite way, one part facing the windows, the other – in place to the chairs. Then the whole windows space will be open to arrange the two brown chairs all along them. Some small coffee table between. Removing the chairs, which I see in the opposite corner. Some draperies, flower pots, vases, colorful trow pillows. I big art piece to the wall opposite to the fireplace- some poufs,Sheepskin, or small oriental rug. I considered those options as well with the furniture placement. However, since there’s an opening, I wouldn’t place the back of the sectional to it. The chairs would look better in the back, that is true. I say better, but they are still too tall for the sectional. An inch or two is fine, but these look to be at least 4-6″ taller. Reupholstery is almost as much as it is to get a whole new chair. A lot of people don’t realize that. Thanks for paying attention to my suggestions. There probably you would write an article about how to measure the furniture, which we are going to buy. Measure twice, cut- once. I think that most people do, do their own furnishing. That is unless you are talking about construction matters. You shouldn’t have to measure the furniture in the store. The measurements are available and usually on the price tag. If not, you can ask the clerk for help with that. What you do need is a scale floor plan of your room before you go shopping so that you’ll know optimal sizes and/or parameters to look for. Here’s a post which explains how to do that. I love those green chairs, but they give me Fat Persons Anxiety. Haha. The chairs are petite but actually 30″ wide which for a little chair is not that small. There’s a club chair with arms that I’ve done that is only 26″ wide. Are you in the south? I understand that people in the south love their swivel-rockers? I hope that doesn’t sound derogatory; it’s not meant to, just perhaps a cultural difference that maybe we should adopt. The chair is one option. My guess is that 95% of the time the chairs won’t be sat in, or they will be there for over-flow. The main activity is TV watching and the sectional is providing ample seating for that. Great post. I hope we get an update from Kathy so we can see how it transformed. Such a lovely canvas she has. I have to agree with Christina on the books. I can’t help myself from wondering, who is the unfortunate person having to dust all that. I am perhaps too pragmatic with a side of no clutter. This could be why my own home lacks that pulled together look. Hmmmm. Something to think about. I may need to relax my brain regarding what I consider clutter. That genuinely made me laugh out loud! But absolutely no offense was taken, so apologies if whatever I said was misinterpreted. I respect other people’s comfort levels. 1. BOOKS! A living room looks cold to me without them. I am guilty of going way to far in that direction, but you’ve gotta have a lots of delicious, beautiful, interesting books! Yes, indeed, there are lots of ways to disguise the TV and that is a terrific suggestion. I think ideally, there should be a work of art over the TV. I know that there’s at least one company that does this in one form or another. That would make for a good post. I did do one about TV options and many have pretty cabinets. None are over stone, however, but some good ideas that could possibly work. Yes, you’re correct, but I feel that the entry set the over-all tone to the home. While not rustic it does coordinate with the stone. The cocktail table does have some rusticity to it as it’s old and the finish is worn. There is more I could’ve added as well. There needs to be something on the other side of the fireplace as well. Time was my enemy and despite telling myself only to spend 6 or 7 hours on the post it was about double that! It may not look like much, but I tried out numerous lamps, pillows, rugs, etc. And this is not necessarily how it would end up had this been a real job. Wow, very timely for me! Just moved to a new house and the greatroom is very similar to ours! Stone, cottonball walls (from your recommendations in a blog) lots of windows, wood floor and ceiling. I dragged all our old furniture over and have been puzzeling over options. I too love green. Have a great oatmeal sofa from the old house and two stickley modern cherry and walnut adarondack style chairs with, yes, brown leather seat and back cushions. I desparately need two new low back swivels and some side tables so as not to obstuct the river view. I think you just saved me as i was looking at some brown seated, tan pattern backed chairs that would have created a boring flat room. (We currently have two high backed loden patterned loveseats and the stickley, sofas will go bye bye). What a great post! I really love the direction your blog is taking! I agree that often once people have put their money into the renovation and purchased the “big” pieces they tend to lose their mojo. I agree with you about the room seeming unfinished. There are no side tables or lamps and blinds woulds go along way toward achieving the warm look she is looking to achieve. I don’t think they would closeoff the view too much. In fact, if they had green in them they would draw the viewers eye outside. Also, the corners of the room also look so bare. I also agree that the wall next to the piano should be a carefully curated gallery wall (it looks like she’s already hung the children’s portraits). One thing you might consider blogging is how to select a framer. So many gallery walls lack the character that can be achieved through quality framing. Frames can add so much texture to a room. Hi, I Love your artical and advice. I am an artist painting statement pieces mainly 1mx1m squares. If you would like to borrow some for your photo shoots send me a note, they could be the splash of colour that you are talking about and that is needed for the layered look. Yes, definitely a table and lamp for the two chairs in the corner. Even another floor lamp. One mistake that people do is rely too heavily on over-head lighting and that IMO is a big mistake. Overhead lighting creates shadows and glare. And it’s hard to create warmth and coziness. Also, I’m seeing too many day-glow (my take) on some of the newer LED lights. It’s like a hospital to me. I HATE THEM! Thank you Laurel, for taking the time to talk and show us about layering! I for one cannot afford to hire a professional interior designer but if I was Kathy I would be in tears. I don’t understand what she paid the designer for, to purchase a couch two chairs and a coffee table? Shouldn’t the designer have helped her pick out shelving, books, throw blankets to wrap around her couch cushions, ( I love when designers do that) lamps a couple of pretty vases! I help clients with styling and accessorizing but only if they ask for it and a lot of them don’t. Loved your blog this morning! 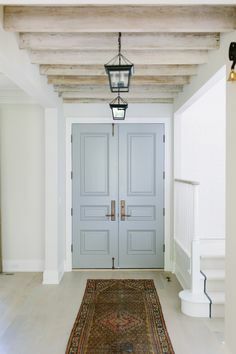 There are a lot of rooms in the “blah” camp right now because the neutral trend (or the gray one, or the one with lots and lots of white) is hard to pull off without expertise using texture, contrast, and scale. (And so much better as a base to use a color as you say!) 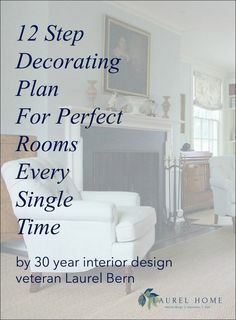 Also design images on Pinterest, Instagram etc often look great when they are minimal and easy to grasp quickly – that does not make for warm enjoyable rooms in real life though. I considered it and yes, agree. But there’s that lovely millwork that would get covered so it was a difficult decision. Only 469 with the Serengeti fabric. Thanks so much for that! Bones are great and windows lovely! I ‘d definitely add some large plants in beautiful pots. She has the room and needs something alive to give the room life. Maybe an orchid or two in addition. Lack of books plusTV as centerpiece of room makes it look as though no one talks to each other and no one reads. I guess banishing the TV to the basement and adding artwork isn’t an option? Agree with all the other suggestions esp need for layered light. Also what’s going on on far side of piano? Looks like a lonely marooned chair. Dang, I was thinking about plants but spent so much time “designing” and time was getting away from me, that I plum forgot. But in a way that’s good because then people can chime in. Yes, plants would be great! But that too, is an art because it’s easy to shlock up a room with a lot of ad hoc plants. (my spell checker does not like shlock and hoc. lol) I love those big potted fig plants and a couple of those would add a lot. I’ve always been one to do the window treatments last–especially if there’s any question at all if we should even do them. And I’ve always favored light and simple, with few exceptions. Not fond of green either, but i think you did a great job! What a difference! From my perspective, interesting to see! Wonderful post — another master class in decorating. Thank you so much, Laurel! and he just bought a new place, so I’m excited to follow along on IG to see what he does. I also love that he designs on a budget, which is helpful! Wow! You bowled me over with all that lucious green! Like Kathy, I adore green, and I really cannot imagine living in a home without a lot of it. Your design ideas really brought the room to life. Those lamps had me drooling, and adding them to my wish list. Your mood board shows what could be an amazing transformation! It definitely adds a lot of charm and personality. However, I think I can see another reason why no one wants to use that room that interior decorating alone can’t address—its the TV location, way up high above the mantel!!! For the life of me, I DO NOT UNDERSTAND how anyone could enjoy watching television while straining their neck like you would have to while seated, not to mention having to forgo a beautiful mantel display and painting above the mantel to create a lovely and charming focal point. But I would love to hear YOUR opinion on the subject, Laurel. Maybe I am misunderstanding the attraction of this “high-up in the sky” trend for TV placement? There are retractable and lower-able TV mounts like the one below that solve the problem of having the TV too high on the wall. Thanks for that. Also, one can get a mounting device that tilts the TV forward a little. That also helps. I forgot to mention that I would also place the sectional back a foot or two. That will help things a lot. And I would also consider layering the area rug with a larger seagrass rug underneath. Well, it makes sense from the standpoint that the fireplace is the focal point of the room and therefore the seating arrangement is facing it and thus, the TV. Oh, how we struggled for years as to where that durned box would go! In years past, it would’ve been housed to the right or left of the fireplace in an attractive built in, or on an adjacent wall or sometimes in the corner in a cabinet. And then, of course, came the flat screen TV and as soon as the price came down to affordable level and technicians became proficient, over the fireplace it went. OMG!! I love everything you have presented. What a beautiful home.. and I LOVE love love William McClure.When I have time- I will investigate his designs some more. Thank yoU! Indeed! I had to restrain myself from lifting his entire portfolio. lol In one iteration the walls are red! It’s awesome too but I prefer the cream.